A stunning 3-cd tribute in honor of Ravi Shankar's 80th birthday performed by several of Ravi Shankar's top disciples including Anoushka Shankar, Vishwa Mohan Bhatt and Lakshmi Shankar. Extensive liner notes. "Shankaragamala" is a canvas of Ravi Shankar's enormous creativity. It is the celebration of the maestro's music by his disciples. The album is a masterpiece, a unique creation of a great legend, who has surpassed all boundaries of imagination with his unrivaled talent and musical style. Album features a beautiful collection of ragas created, reconstructed and named by the legend, who perhaps needed an outlet for his creativity after mastering hundreds of ragas already existing in the Hindustani Music system. The 28 ragas spread over 3 volumes of this album have been rendered by the maestro's disciples, who are today celebrated artistes in their own right. 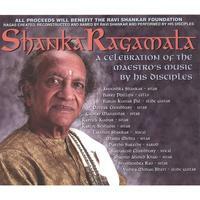 Recorded/produced by Barry Phillips with Ravi Shankar overseeing the performances as executive producer. This three-volume set contains 28 ragas, which have either been created by sitar maestro Pandit Ravi Shankar or "organised," as he says, altered, by him in such a way that they became popular and established a trend in their new form. Vocalist Lakshmi Shankar has also contributed a song in the raga Parameshwari. Other disciples of Ravi Shankar who have performed include Pandit Vishwa Mohan Bhatt (slide guitar), Gaurav Mazumdar, Partho Sarathy, Shubhendra Rao, Anoushka Shankar and others. Beginning with Anoushka's rendition of the raga Gangeshwari, with deep and sonorous notes, it goes on to Bhawani Bhairav by Partho Sarathy and the sweet Bairagi Todi by Deepak Choudhary. The first volume ends with a lilting rendition of Rajya Kalyan, again by Anoushka. At the beginning of Volume 3, the composition Rasiya, which Ravi Shankar prefers to call a dhun (tune) rather than a raga, played by Shubhendra Rao on the sitar, brings back memories of some of the most alluring pieces that enshrined the maestro in the hearts of music lovers. There is also the stirringly sweet Jogeshwari played by Vishwa Mohan Bhatt. The set is accompanied by an informative booklet listing not only the names of the compositions and resumes of the artistes, but also Ravi Shankar's remarks on some of the ragas and how they came to be created. The compositions are collected from recordings made across the years in various situations and locations, and mastering must have been a challenge for sound engineer Barry Philips, also disciple of Ravi Shankar and a cellist, who has performed the raga Palas Kafi in a duet with Anoushka. Tabla accompaniment has been provided by Bikram Ghosh, Akram Khan, Tanmoy Bose and several others. This collection is more than a collectors' item or an attraction for the classical music enthusiasts alone. With the variety of pieces, mostly short and racy, the music is likely to appeal to casual listeners too. After all, hasn't one of Ravi Shankar's great contributions been his introducing classical music to an uninitiated audience? I feel blessed to have the honor of listening. It is a blessing to listen to these recordings. Completely enchanting x 3. Or as my daughter would say, "awesome." I guess I would say, I'm full of awe. Performed by several of Ravi Shankar's top disciples, including Anoushka Shankar, Vishwa Mohan Bhatt and Lakshmi Shankar, "ShankaRagamala" presents a 3-CD tribute to the one and only Ravi Shankar, arguably the most influential Indian artist in the West, not to mention beyond. In honor of Shakar's 80th birthday, this extensive collection delves deeply into the Indian classical tradition, making one of the most notable, comprehensive packages available. This is not only a collector's item but a hearty contribution and genuinely rich and musically-nourishing project.